So, the much anticipated QLab 4 has arrived and with it a new branch of functionality that may or may not have caught you by surprise. 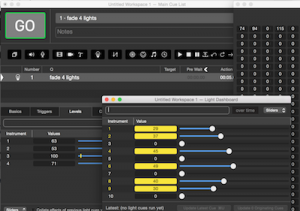 On Stage Lighting looks at the new lighting control capabilities of QLab 4 and considers future developments. If you have been around for long enough to remember the release of previous QLab versions, you’ll have a handle on the development history. Looking back QLab 1 was a functional playback tool for digital media that now seems quite raw. What Chris Ashworth and Figure 53 have always given us with QLab is possibility, not only in current incarnations but also scope for the future. QLab has always enjoyed a high level of user interest in its development, a positive feedback loop that the team at Figure 53 has managed well. QLab 2 came with significant developments that made the product seem a lot more complete and ‘finished’. Just when we were all bumbling along happily with QLab 2, version 3 appeared and hit us like a strangely pleasant baseball bat to the face. The leaps in functionality came in many areas, but video playback and manipulation complemented the other tools in audio and show control. It’s worth reflecting on the huge gear change that came with QLab 3, something that left users wondering what the upcoming QLab 4 release could possibly do to match the level of innovation that hit with the release of version 3. Prior to the release of QLab 4, we had many options for audio, video and show control cueing using QLab. We had much fewer options regarding the control of stage lighting systems. These options all use show control systems such as MSC, MIDI or OSC to fire a compatible lighting desk. We recently looked at OSC around the time that Cham Sys added it to the MagicQ range. We also looked at using the software LX Console and OSC messages to create an ‘in-Mac’ lighting controller package that was cued via QLab. QLab 4 now comes with built-in lighting control right out of the box. It may now seem obvious that the next development in QLab was to be in field of lighting, the department that thus far only had a limited amount of QLab love. Culturally, the realm of audio and video playback has been firmly in the digital software domain for quite some time. Lighting control has been culturally different so far. Personal computer based lighting control has been, and often still is, considered to be second-best and dedicated hardware lighting controllers are preferred. No matter how many tablet apps or PC versions are released, *8 out of 10 lampies say that they would chose a hardware desk over a software solution. Here at On Stage Lighting, we have a fair bit of stuff on the really ‘hands-on’ side of lighting e.g Busking and running lighting ‘live’, even though I teach QLab on a regular basis. The practicalities of these techniques do require some level of hardware interface. However, there are plenty of shows that are pre-packaged and cued and this kind of programming and playback is where QLab excels. As in audio and video cueing, the standard ‘theatre-stack’ approach to playing back pre-recorded lighting cues is where QLab fits into the world of lighting control. How does QLab 4 control lighting? QLab can now output ArtNet and send it over a network. If you know much about lighting control systems, you’ll know that ArtNet is a protocol for sending DMX lighting control signals as network traffic. So, to talk to your dimmers or fixtures you either send ArtNet directly into them or use one of the many boxes (nodes) that turn ArtNet into DMX data and then fire that into the kit. Now we know how QLab outputs to the lighting system, you can imagine that QLab has a new cue-type called Lighting. This cue stores the LX cue data and is inserted into the QLab cue list in the usual way. Compared to our homebrew method using LX Console, these replace the OSC cues and allow us to edit the cue data within the cue itself. So, we don’t need a hardware console now an extra piece of software, nor do we need to insert show control trigger cues. QLab has now become the lighting desk as well as the media server, audio playback and show controller. What kind of show could QLab 4 control? Let’s be clear. QLab 4 is not going to replace a pro level hardware lighting console any time soon. The software interface not yet suited to interacting with a large lighting rig of complex fixtures and this isn’t something anyone would pick this solution for. Conventional dimmers and basic LEDs are currently where the interface is pitched and it’s worth noting that even high dimmer counts are not going to be as seamlessly command as with a dedicated lighting control. Where this additional functionality really fits into the picture is a small touring show with a low dimmer count and perhaps some LEDs. Being able to run toured or house dimmers that have been soft patched into the show file, all from the same cue list as the audio and media, is a really attractive option for many shows. This is ideal for a cued show controlled by a single touring tech or SM. QLab 4 has the ability to assign a fixture type to a particular handle, what we might call the channel. This fixture can be patched to the particular DMX start address on the ArtNet stream. You can assign a variety of built-in fixture profiles or create your own. Note: QLab is not a lighting desk. Yet. I’d avoid hoping to run an arena of multi-head fixtures at the moment, the interface just isn’t up to it. QLab has an interested approach to groups that differs from many lighting desks. Groups are abstracted so that the cue references the group every time. This means that updating a group has the effect of updating all the cues that reference that group. Control of channels can be achieved via a simple command line like interface, interactive faders or tombstone-esque tiles that can be dragged with a mouse over them. The biggest departure from lighting control convention is the use of = rather than @. This makes sense in context. The cue that gets inserted into the cue list. The editable parameters of this cue include the ‘channel’ levels. To simplify cueing in a stack, QLab 4 tracks by default. The developers have pitched this to help non-expert users and so tracking tools such as hard and soft blocks are avoided. The cue list behaves as a QLab list should, including the lighting cues: Stuff happens until you tell it not to. Audio plays, video rolls, lights stay on etc. QLab is first and foremost a cueing and integration software. It aims to bring together a range of production disciplines and provide a flexible and programmable environment that is user friendly. It provides tools for the programming geeks yet remains simple enough for the stage management team. The power in QLab for lighting control is the integration and potential for scripting, along with the central point of control for rehearsals and performance. These things are not without their own pitfalls, but while Figure 53 remains responsive to its user base the addition of lighting functions can only be a positive move. Is QLab 4 a huge leap forward? Earlier on, we considered the levels of innovation that have come with previous QLab releases and the particularly large leap with QLab 3. We haven’t really looked at the other developments in QLab 4, concentrating on the ‘main thing’ with this release which is arguably the lighting stuff. On the one hand, if you know your lighting control systems you may be underwhelmed by QLab as a lighting controller – at the moment. However, before you decide that QLab isn’t going to make inroads into the market share of your favourite brand of console, remember what the functionality is aimed at. If you are a certain part of the small venue or micro-touring market, particularly if you already rely on QLab for complex multi-media cueing fired from a single point, then the addition of a controller to deal with your small lighting rig looks heaven-sent. I’d argue that adding a whole new department to the software IS a huge leap and continues the Figure 53 theme of possibilities for the future. Cueing software is a niche market in a niche market in a niche market. QLab has become ubiquitous in that space and industry practice and show running conventions have developed along with technology, not least QLab in particular. The new release ‘baseball bat level’ may have dialled back a little this time around compared to that of the release of version 3 but it’s now time for the users to make new discoveries with the tools that Figure 53 has brought to the table. With thanks to Chris and Figure 53 for letting me enjoy a pre-release test drive. Could you tell me why Figure53 chose Art-Net over usb-dmx ? Or why not implement both ? And more generally, could you tell me how Art-Net is better or more reliable than usb-dmx ? I find usb-dmx very convenient, as it is just plug&play. No need to enter data, ip, etc… as with Art-Net. Couldn’t say. Others have asked why not sACN so I guess there are always some who are disappointed. I’d imagine that implementing different output types isn’t the hardest part once the basic functionality and UI is in place. Prior to QLab 5, I had never heard of ArtNET. Now I’ve been trying to find out which “node” / interfaces / adaptors / boxes are compatible, but having a hard time knowing where to start. Can you please give some recommendations for compatible ArtNET nodes, or even just a sample list of equipment I can research and try out myself? Thank you! Enttec and DMX King make some cheap single universe Art-Net to DMX boxes. Elation make some for larger systems. Anything that is a simple USB to DMX dongle isn’t Art-Net and won’t work with QLab.